It was the best of times, it was the worst of times. That pretty much sums up the state of development for the Chester Valley Trail. The trail in Chester County continues to chug along, growing inch by inch as the months pass, while Montgomery County's plan to connect the trail to the Schuylkill River Trail has suffered a major setback. But let's start with the abundance of good news. The pace of the development of the Chester Valley Trail in Chester County is breathtaking, reminiscent of Montgomery County's 3 year marathon to build the Perkiomen Creek Trail ten years ago. Phase 1 was opened in September 2010; Phase 2 is 65% complete with most of the trail overlaid with a stone base with some sections already paved. The heavy lifting of this project will be the completion of bridges over North Valley Road and Valley Forge Road and a culvert (tunnel) under Warner Rd. Look for a late summer (September) or early fall opening. Meanwhile Phase 3 has recently received approvals that will help close a gap in the trail near the Exton Square Mall. 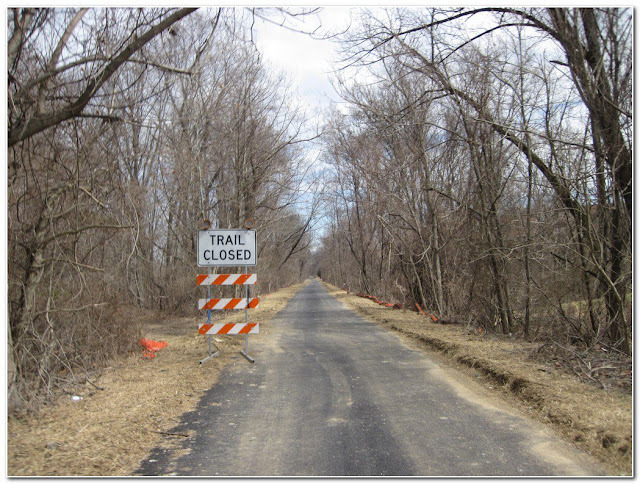 The Chester Valley Trail website gives Phase 3 a general completion date in 2013. West Whiteland Township is also laying the groundwork to conduct a study for extending the trail one mile west out to Whitford Rd. In Montgomery County, a two mile stretch along the recently acquired East Penn Railroad Right of Way is scheduled to go out to bid for construction later this year.This would leave a two mile gap between Saulin Blvd and South Gulph Road in Upper Merion Township. Which brings us to the PA Turnpike Authority. This quasi-public organization recently rejected Montgomery County's request to obtain a 1/2 mile easement parallel to the Turnpike. The County currently has zero local matching dollars budgeted (this could change in the next three months) to explore and engineer alternatives. To our knowledge, the Turnpike has not given a public explanation as to why they would stand in the way of a regionally significant trail project. Is there another widening project planned? Does it have anything to do with SEPTA's proposed alignment of the Norristown High Speed Line to King of Prussia? The reality is that in this heavily developed and trafficked area with few bike or walking options, right of ways for this trail are few and far between. Our fear is that having the County go back to the drawing board may set back the project for years and result in a loss of the federal dollars already obligated to the project. The best course of action is for the Turnpike Authority to go back to the negotiating table with Montgomery County and find a way to help complete its segments of the Chester Valley Trail. The Bicycle Coalition mailed a letter to that effect to the Turnpike Authority last week and copied the Montgomery County and Chester County commissioners.